I’ve been reading Wood Pattern-Making by Herbert J McCaslin. It’s the 1997 reprint of a much earlier book and I have to recommend it as being an interesting and potentially useful read for people interested in casting (or woodworking). 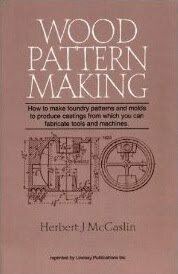 It’s important to realise that this book is ONLY about pattern making, there’s nothing about casting in general and a small amount about how you would use the patterns once you’ve created them. The book starts with an introduction to some of the woodworking tools you might use for making patterns, more tools and techniques are introduced as the book progresses. Likewise the patterns it starts with are also simple to make. The each chapter looks at a different problem and logically introduces new concepts such as cores and core boxes, turning and split patterns. It finishes with complex curved and flanged items and hand-wheels and flywheels which are more complex than you might imagine. Some of the problems raised such as pattern strength may not be an issue for the small patterns model engineers are likely to make but the techniques mentioned are definitely valid and the worked examples are excellent. There are questions at the end of each chapter if you want to use the book as a study guide. You really need to read the book in order to get the best from it but once you have then you can use it as a reference book for specific problems. There is a comprehensive index and plenty of diagrams. I can thoroughly recommend this book.